SPIE organizes the Optics + Optoelectronics symposium every second year, in 2019 at the Congress Hotel Clarion in Vysočany in Prague on April 1 - 4. Apart from the fact that specialists from IPE preside over four subcofnerences out of 18, this year they prepared a novelty - a specialized workshop and a subsequent excursion to the laboratories of optical fiber technology in Suchdol, Prague. 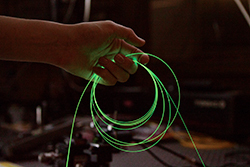 An important guest of the program will be Erich Spitz, a French physicist of Czech origin who will commemorate the extraction of the first single-mode optical fiber in the world. Official press release (in Czech only) to download.